Today was day 2 of the Social Cities of Tomorrow event. Work on all four of the cases is now well underway and we thought it would a good idea to ask the teams for a quick update on how they’re doing. So, around lunch time today, the halfway point for all workshop activities, each of the teams gave a quick presentation about what they’ve been doing so far. First up was the Urban Pioneers Zeeburgereiland case. Here the team was asked Temp.architecture to formulate a strategy for the collaborative development of an empty urban space in the Amsterdam area. This is a huge plot of land with lots of potential and therefore the city of Amsterdam is actively looking for proposals on how to best develop it over the next ten years. Seeing how ten years is a long time and the workshop only lasts three days, the team decided to focus on a plan for the first year. The Zeeburgereiland area is sandwiched between two different residential areas and the team came up with the idea to turn, at least part of the area, into public gardens. Local inhabitants would be able to rent plots of land for a year to use them as they see fit. The trick is, though, that part of the areas would be public or flex space that could be used by several of the plot owners. For example, two neighbors could use their adjacent pieces of flex space to create a play area for both their children. Also, to reinforce a sense of community amongst the renters, a collaborative effort will be needed to help maintain the garden area overall. To help make this happen, the team envisions an app that lets plot owners communicate with each other while simultaneously keeping track of who contributes what. For the remainder of the workshop, the team plans to further flesh out and visualize this idea and hopes to build a mock-up app to illustrate the idea and potential of such a tool. 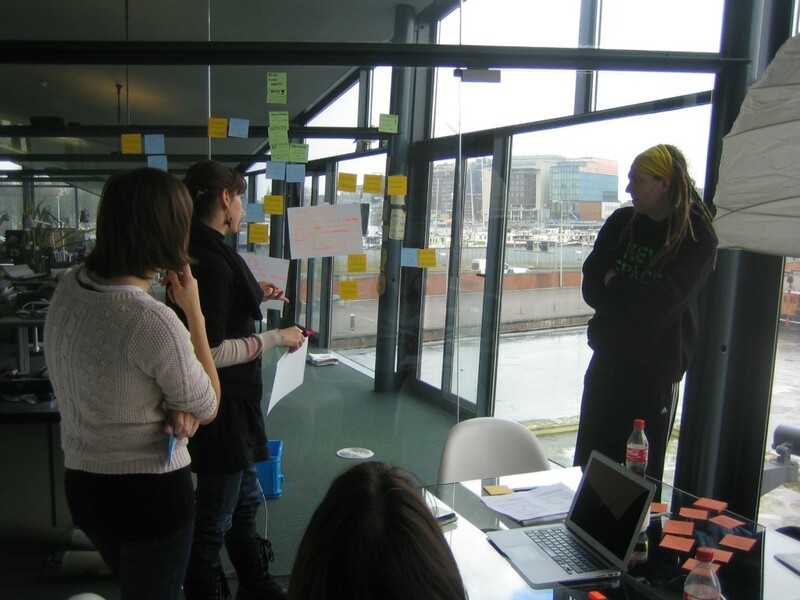 Team 2 is looking into how to revitalize two industrial quarters in The Hague’s docks area. The area is known for its wide variety of small businesses focused on the automobile, building and graphical industries. Though rich in character, the area lacks good public spaces and could benefit from a stronger sense of community. Based on suggestions by Stroom Den Haag, the team started looking into the area’s cultural and economic values with the intent to leverage these in order to improve the quality of the public space in the neighborhoods. After a tour of the area on day 1, the team realized that the values themselves were in fact pretty clear from the start. The greater issue that came to the fore, however, was the apparent disconnect between the local inhabitants and the local municipality. For the last decade many different plans have been proposed to grow the area into something greater. All of them have failed, thus causing the locals to lose faith in the city council and its ability to come up with and execute good ideas. Therefore the team is now focusing on how to rekindle the dialogue between all the stakeholders, so that real progress can finally be made. Any first intervention in the public space will have to start small and rely on a mix of online and offline media. A small initial success could not only kick start the revitalization of the area, but could also help revitalize the communication and good faith between the area’s inhabitants and the city council. 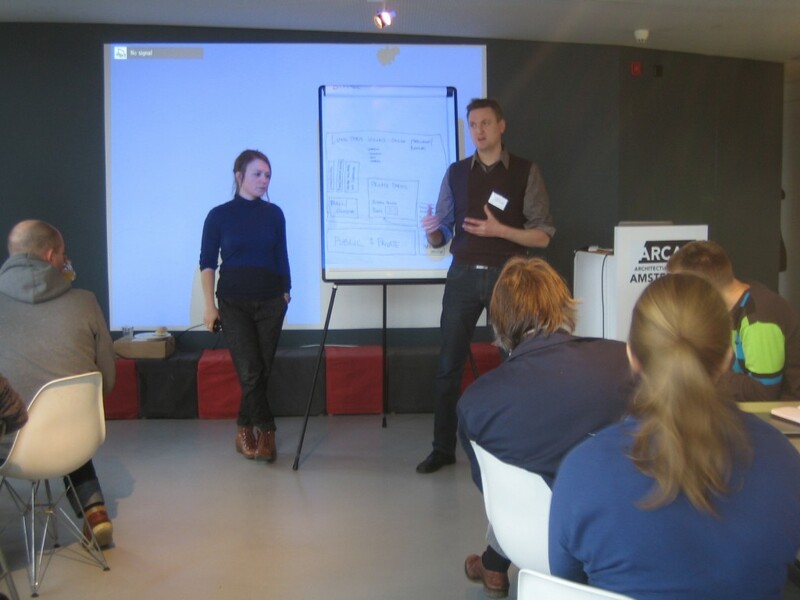 Together with Trudo, the third team is working on the Strijp-S project in Eindhoven. Strijp-S is an urban development project that seeks to turn this former Philips industrial area into a lively, urban center filled with different forms of housing, offices, art institutions and leisure functions. Given how this area has a distinct industrial history, combined with Eindhoven’s reputation as a top technology city, Trudo asked the Social Cities of Tomorrow team how to best integrate digital media into Strijp-S’s public spaces. After having visited the area on day 1, the team became aware of how the entire area used to be walled off; it was private Philips property and only employees were allowed entry. Nowadays the walls are gone, yet the area is completely devoid of activities. Obviously, the complete makeover of this area will take some time. So as a lead in to bigger plans, team 3 think it best to somehow make the inhabitants of Eindhoven aware that this space still exists and is in fact worth visiting. The team is therefore conceptualizing an online/offline game, possibly with augmented reality elements, that could pull players towards the area and in doing so start the process of returning life and activity to this amazing area. The team is even discussing the possibility of rebuilding the walls around the area so some of that original sense of mystery returns. For the remainder of the workshop, team 3 intends to continue working on their game concept. What should it look like? What kind of rules should apply? Who exactly are the players? 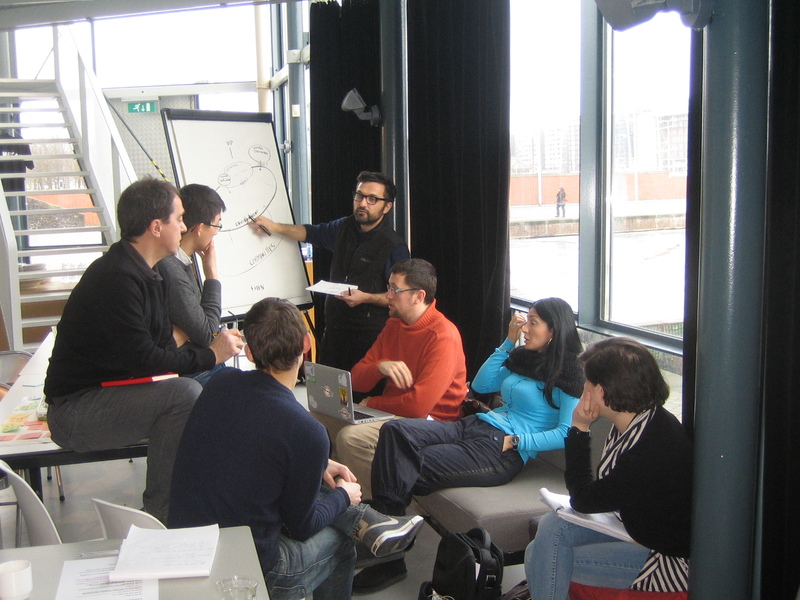 The fourth and final team is working together with the Amsterdam municipality in an attempt to conceptualize a civic innovator network for the city. Traditional top-down methods of innovation pushed by the city council are no longer working as well as they used to. Today there exists a greater need for transparency, cost reduction and efficiency. In order to create sustainable and fruitful urban innovation projects, a stable network with room for bottom-up communication with all stakeholders needs to be developed. The team visited the municipal office for economic affairs and a local initiative called ‘Hack de Overheid.’ Here team 4 discovered that the innovation efforts so far have been piecemeal and incoherent. There is a greater need for coordination within all of the city’s departments so that a unified urban innovation strategy can be developed. Ultimately, this strategy should provide ample room for Amsterdam’s inhabitants to take initiative and drive innovation for themselves. 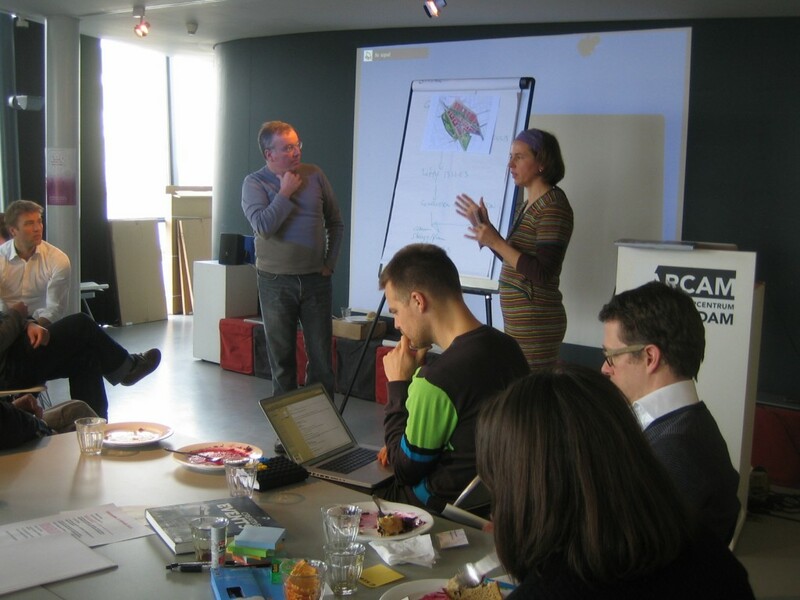 However, before this civic innovator network can become a reality, some cautious first steps will be needed to help change the mindset within Amsterdam’s municipality. It was quite impressive to see how much the teams had managed to learn and achieve in such a short time frame. With this in mind, I can’t wait to see what tomorrow brings us.